My name is Arron King. I work for VMware as a Technical Account Manager – focused on helping Ohio SLED organizations continue their virtualization journey. 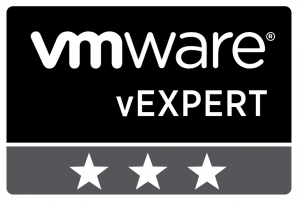 I hold the VCP65-DV certification, and have been named a vExpert in 2017, 2018, and 2019. I am active on Twitter, and publish a monthly newsletter with virtualization news that is useful for my customers. I have held several positions during my career. Most recently, I worked as a Systems Engineer at a Value-Added Reseller designing, installing, and upgrading infrastructure stacks. Before that I spent nearly 10 years working on a virtualization team for a private airline with datacenters on multiple continents. I have also worked as a Systems Administrator at a University, and as a Software Developer for an Insurance company. Like many of you, my knowledge and work has been influenced by many blogs on the Internet. My goal is to try and contribute something meaningful. I hope the information you find here is useful to you in some way.